When I'm not being a nerd by fighting wars with little army men, or being a mega-nerd by playing super-complex board games like Advanced Squad Leader, I like to be an ultra-nerd by playing good old Dungeons and Dragons. Right now I'm hosting a DnD game set in the old-school campaign setting of Dark Sun. 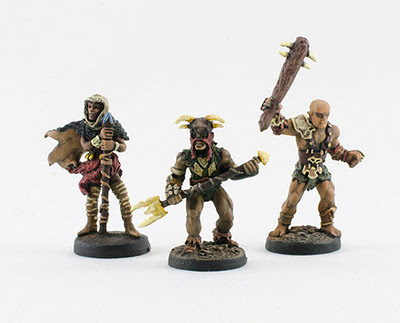 The good thing about Dark Sun is that it's full of awesome background and flavour; the bad thing is that regular fantasy miniatures really don't suit the characters. So, why not go with some miniatures that were designed for the setting? 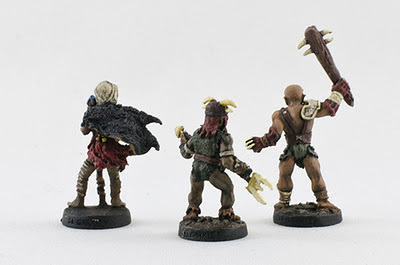 I bought these miniatures from a guy on The Miniatures Page, who threw in a pack of Dark Sun elves to go with them. Because they were made a long time ago, the miniatures are quite a bit smaller than the current, GW-fuelled standard of cartoony, 30+ mm fantasy figures. They are really cool sculpts with lots of Dark Sun style, though, and they work really well for our game. Mordheim: Back to the front!